Kick off summer with the City of Fort Lauderdale at the annual Great American Beach Party on Saturday, May 27, 2017 from 10 a.m. to 8:30 p.m. on Fort Lauderdale Beach! During this fun-filled, all-ages event, the Sun Trolley and Water Taxi will be providing transportation to alleviate the hassle of driving to the beach and finding parking. Beach Link: 9:30 a.m. to 6:30 p.m.
Las Olas Link (extended hours): 9:30 a.m. to 9:30 p.m. 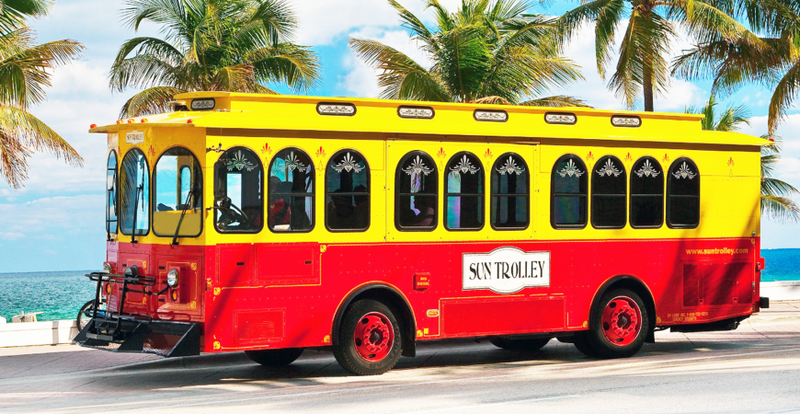 The Sun Trolley will also operate a special Great American Beach Party loop which will travel directly from the City Park Garage in downtown Fort Lauderdale (150 SE 2 Street) to the Las Olas Marina (240 E. Las Olas Circle) from 9:30 a.m. to 9:30 p.m. Track Sun Trolley in real time by downloading the app at SunTrolley.com. “We hope that by offering these extended hours, customers can head to the Great American Beach Party and enjoy it stress-free, without worrying about finding parking,” said Robyn Chiarelli, Executive Director of the Downtown Fort Lauderdale Transportation Management Association (DFLTMA). Trolley fares for the Beach and Las Olas Links as well as the dedicated Great American Beach Party loop are $1 each way or $3 for an all-day pass. To ride the Sun Trolley, just Wave ‘n’ Ride! Like hailing a cab, guests should stand in a safe location anywhere along the route and wave at the trolley driver signaling they would like to board. and run every half hour from 10 a.m. to 11 p.m. Round Trip fares are $5 per person. Active military, seniors 65 and over, and kids under 3 are free. The Great American Beach Party is a free, fun, family-friendly event that will feature seven live bands on two stages, as well as a family fun zone, sand castle contest, art show, classic car show, and life-size beach games!